Have you ever wondered why we tend to make chicken noodle soup when we are sick? As it turns out, the warm soup helps break up the congestion associated with both colds and the flu. The salt in the soup and its warmth can soothe a sore throat. Plus, the chicken contains an amino acid called cysteine, which helps thin mucus in the lungs, helping to relieve congestion. 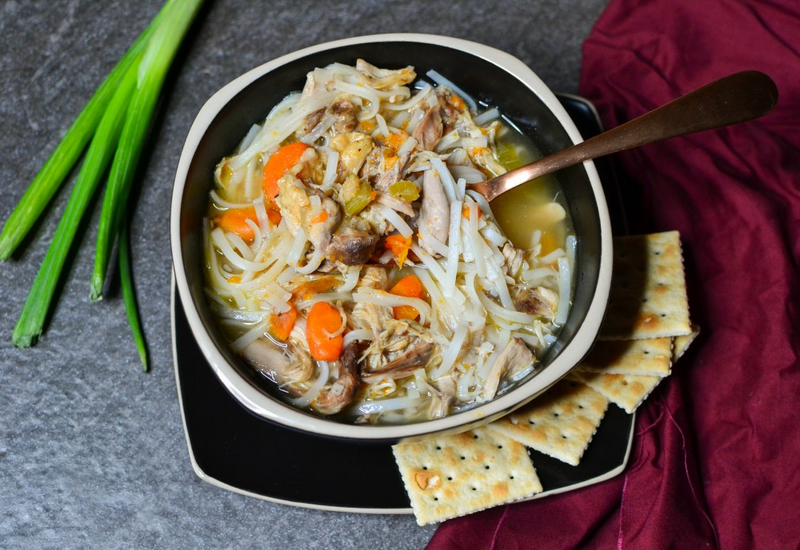 Sounds like this Pressure Cooker Chicken Noodle Soup is just what the doctor ordered! Our easy comfort classic is prepared in the MultiPot. This feel-good recipe includes seasonal vegetables like carrots and celery flavored with herbs and spices. Plus, it is ready to eat in just 40 minutes! Per Serving: 110 calories; 3g fat; 15.3g carbohydrates; 6g protein; 11mg cholesterol; 649mg sodium. Delicious recipe! Perfect, homemade chicken noodle soup. So easy and quick. This chicken noodle soup was excellent. All you really need are carrots, celery, and a good stock. This recipe has all of these ingredients and some. The chicken was so tender, it just fell off the bones. The best part was that it took under an hour to make. The only thing I changed for this chicken noodle soup recipe is that I used boneless, skinless, chicken breast and shredded the meat. This is a classic, straight forward soup recipe without all the fuss, thanks to using my pressure cooker. Perfect for cuddling up on a cold day, if you are sick, or just want some good comfort food that's easy to make. I add hot sauce to my bowl for some extra kick! Delicious soup. The thyme, garlic, and onion really add so much flavor! Do not skimp out on any of these simple ingredients. It's definitely one of my favorite comfort food dishes and easiest recipes to make in my Multpot. This was really delicious! The entire family loves it. I used boneless chicken so that it was easier to shred. Can't wait to make this again soon. Best chicken soup I ever made. Perfect for a cold, rainy night’s dinner. Delicious and perfect. I ALMOST want to say that I can't wait to be sick and enjoy this again! I did add more celery and carrots than the recipe called for.